For some reason we find ourselves writing a hell of a lot about the sunglasses worn in various movies. We’re not sure why, as personally I’m pretty indifferent about any sunglasses that don’t go by the name of Ray Ban Wayfarer, but it seems like a lot of people come searching for information about movie sunglasses so I guess we’re honor bound to write about them. The Book of Eli sunglasses, despite my previous statement about not caring, are pretty damned cool. The Book of Eli was heavily sponsored by Oakley, the Canadian sportswear company, and you can see their products in pretty much every frame of the movie (we’ve already written about the Book of Eli backpack). The sunglasses from The Book of Eli (well, the ones worn by Denzel Washington, in any case) are Oaklay Inmates. Washington’s frames were polished chrome with black iridium lenses, but several options are available. The lenses themselves actually played an intrinsic role in the movie. If you pay attention to the subdued, washed out tones of The Book of Eli it doesn’t take a big leap to realize that the movie was shot as if seen through the black iridium lenses. The lenses themselves are very dark, allowing only about 15% of available light through, and the polarization removes glare from the sun, giving the landscape a sepia-toned subdued hue. We think it was a great idea, and it certainly gave The Book of Eli a unique and instantly identifiable look. As we’ve come to expect from Oakley releases, the Inmate sunglasses have garnered some incredibly positive reviews. The Amazon customer review section is fairly conclusive, with 8 out of 9 reviews offering a 5 star rating – and the only outlier, a 4 star review, only had an issue with the color of the frames he’d’ chosen (which can’t really be blamed on Oakley). 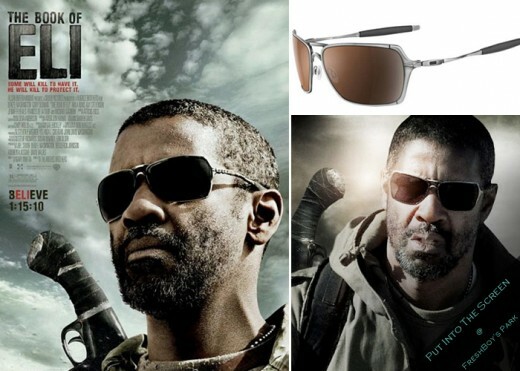 The Oakley Inmate sunglasses from The Book of Eli are available from $144.88. The polished chrome/black iridium frames sported by Washington in the movie retail at $170.